The French government on Thursday urged "yellow vest" protesters not to hold another round of demonstrations this weekend as police hunted for a second day for the fugitive gunman who attacked a Christmas market in the eastern city of Strasbourg. Police across several European countries have launched a manhunt for the main suspect, a 29-year-old Strasbourg native, who killed two and injured 13 after opening fire on shoppers. So-called "yellow vest" protesters, known for their fluorescent high-visibility jackets, had called for a fifth round of protests this Saturday against President Emmanuel Macron. The appeal came as authorities announced that a sixth person had died since the start of the protests, after a 23-year-old was hit by a truck in southern France near Avignon. 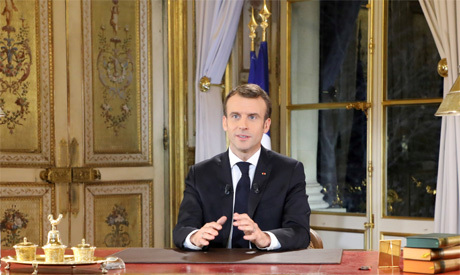 Macron also announced a hike in the minium wage, tax relief on overtime work and a rollback on taxes for many pensioners in a televised address to the nation on Monday night. Last Saturday nearly 90,000 police were mobilised across the country for the protests, with 8,000 officers and a dozen armoured vehicles deployed in the capital, where scores of stores, museums and monuments were closed. While some of the movement's representatives have said they are open to halting the protests to negotiate with the government, others have said Macron's concessions are not enough. Strasbourg's location at the crossroads of France, Germany, Switzerland, Belgium and Luxembourg, makes the search more complicated. Chekatt, who lived in a rundown apartment block a short drive from the city centre, was flagged by French security forces in 2015 as a possible Islamic extremist while in prison. Prime Minister Edouard Philippe announced Wednesday that France's anti-terror Sentinelle operation, which counts around 7,000 soldiers nationwide, would be boosted by a total of 1,800 troops over the coming days. Among the casualties in Strasbourg, two were killed outright and another has been declared brain-dead, while 12 more were injured, six critically, France's anti-terror prosecutor Remy Heitz said. They included one Thai tourist who was among the dead. Thai Prime Minister Prayut Chan-o-cha sent a letter of condolence to his French counterpart saying he was "profoundly shocked and saddened to learn of the horrendous attack in Strasbourg". The statement said the Thai citizen had been on holiday in the city.